Fall is here, and so are pumpkins. I use them for decorating, baking and even for dinner. Don’t be intimated by pumpkins, as they are very easy to work with, and if you have ever cooked with squash, it’s the same concept. Slice the pumpkin in half, remove the seeds along with the outer skins, and dice it. Another simple way you can prepare fresh pumpkin is to cut it in half and just remove the seeds, brush it with olive oil and spices and then roast it that way. It’s also amazing when you serve it stuffed with vegetables and even sausage. In this recipe, I diced the pumpkin and cooked it with spices, a little bit of balsamic vinegar and some maple syrup, then added it to quinoa. 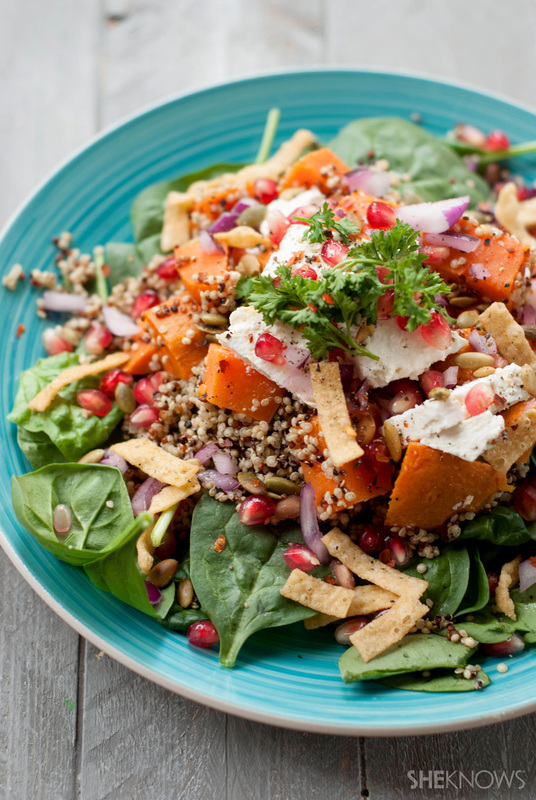 Once it’s done roasting, fluff the pumpkin and quinoa with a fork, and serve it over a simple mixture of fresh spinach and fall-inspired toppings. 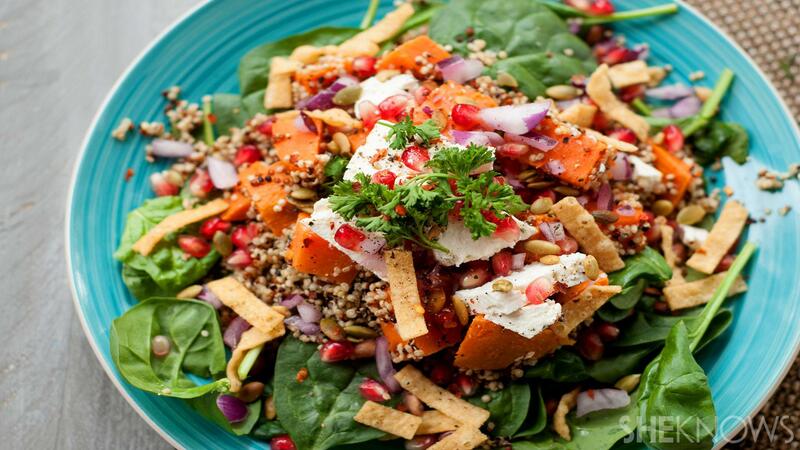 This versatile recipe uses fresh pumpkin that is roasted in the oven along with quinoa and then served over salad greens with crunchy tortilla strips, pomegranate and spicy feta cheese. To a casserole dish, add the quinoa and vegetable (or chicken) broth, and mix. To a mixing bowl, add the diced pumpkin, onions and the remaining ingredients. Mix very well to evenly coat the pumpkin and onions. Transfer the pumpkin mixture to the casserole dish, and cover. Roast in the oven for 40 minutes or until all the liquid has absorbed into the quinoa and the pumpkin is tender. To a large serving bowl, add the fresh spinach. Fluff the pumpkin quinoa with a fork, and transfer it to the serving bowl. Top with crunchy tortilla strips, red onions, pomegranate and spicy feta cheese. Garnish with freshly chopped parsley, and serve warm.